The last major element of the Canadian Army’s modernization of its medium logistics support capability, the new Standard Military Pattern (SMP) trucks, evidently has a budding fan club. Two of the 9.5-tonne capacity four-axle SMPs, from Pennsylvania-based Mack Defense, were unveiled in September at Canadian Forces Base Petawawa, where senior officers and the troopers who will operate and maintain the vehicles were joined by Defence Minister Harjit Sajjan and Mack Defense president David Hartzell. 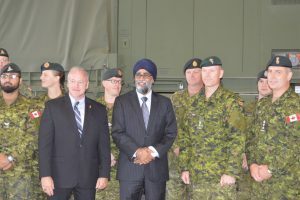 “I was really happy to hear one of the corporals say this is literally the best vehicle in the Canadian Armed Forces fleet,” Sajjan said afterward, explaining to Canadian Army Today that the high praise from the trooper was clearly warranted. “This is light-years ahead,” he agreed, recalling previous generations of trucks, dating to when he was in basic training. Sajjan repeated the government’s mantra about giving the Canadian Armed Forces what they need for missions at home and abroad. “When our members know that they’re being looked after properly … you know that they’re going to have the confidence to be able to do their job even better.” And easier – no more grinding the gears because the new trucks have automatic transmissions, an accelerating trend in civilian trucking. The procurement from Mack began in July 2015 when the government awarded contracts worth a total of $834 million for the new trucks, trailers, armoured protection systems and in-service support. Petawawa was the second base to take delivery, Edmonton being the first. 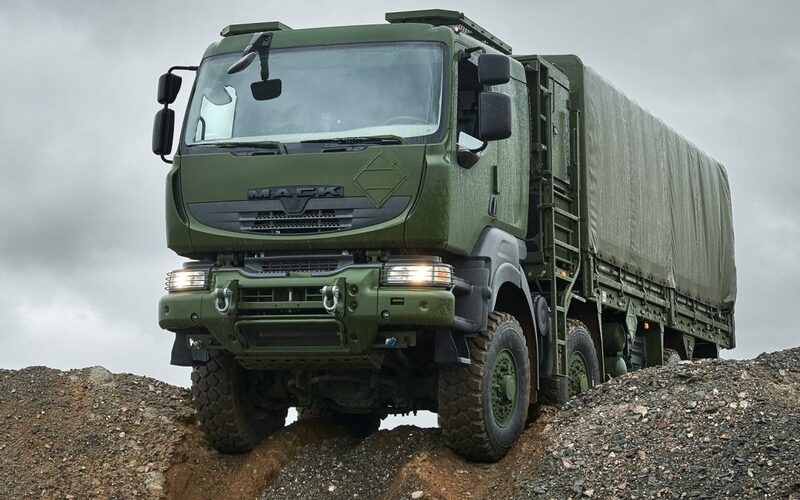 The total truck order is 1,587 and once the last is delivered in 2020, more than 100 units across Canada will be assigned at least one and as many as 70, the number tailored to individual mission requirements. 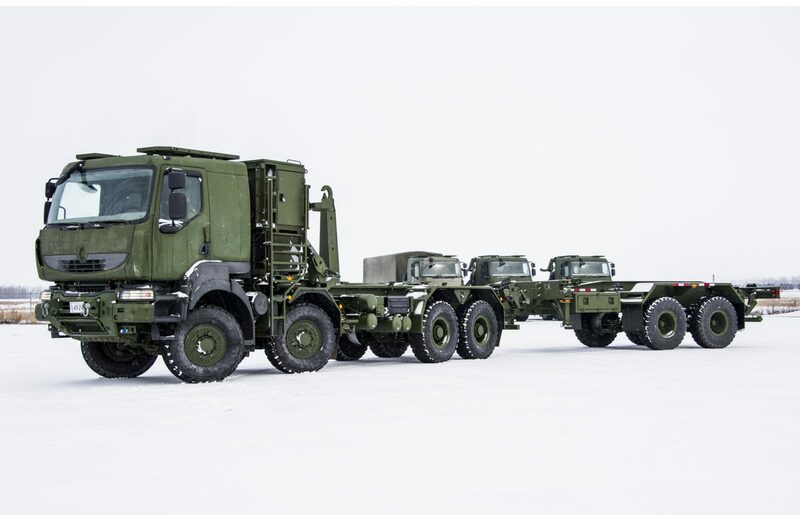 The SMPs are the fourth element of the Army’s Medium Support Vehicle System (MSVS) project, the first part being a completed buy of 1,300 smaller off-the-shelf commercial trucks. Navistar Defense supplied the rolling stock to DEW Engineering in Ottawa. The second and third elements, also completed, were six “shelter” variants, essentially ISO container-based workspaces. Four were manufactured and kitted out by DEW as the prime contractor; the two others were subcontracted to Weatherhaven in Vancouver. The fifth phase involves ongoing minor infrastructure upgrades at various bases. As with most major military equipment buys, the SMP truck deal is subject to the government’s industrial and technological benefits (ITB) policy, which requires that for each dollar spent on the procurement, the contractor must put a dollar back into the Canadian economy. Major offsets include the armoured cab from Dumur Industries of White City, S.K. ; car armour kits from EODC in Ottawa; the cargo bed from Craig Manufacturing in Hartland, N.B. ; and the load-handling system trailers, part of the load-handling system platform, from Link Suspension Systems in Edmonton, A.B. Shipping overseas usually is done by ship, a cheaper option, but when time is of the essence, the Royal Canadian Air Force’s fleet of Boeing CC-177 Globemaster IIIs, flown by 429 Transport Squadron out of Trenton, Ont., would come into play. Colonel François Lavoie, the MSVS project manager, highlighted the armoured cab option. “It’s a full 360 protection – ballistic and blast – so it brings in added flexibility to swap vehicles if anything should happen to the remainder of the vehicle.” He said it takes three people, a total of 30 person-hours, to change out the conventional “soft” cab for an armoured one. Hartzell pointed out that every SMP, built at the rate of four a day on a dedicated line parallel to Mack’s commercial line in Allentown, Pa., which can push out 100 vehicles a day, is delivered with a commercial cab. The 160 armoured options, mostly steel and composites, were a separate deliverable by Dumur.